The text below is my response letter to Attorney Bruce Rosen representing Canadian lawyer Julie Stewart of Blackline who represented Hawaiian Art Network. Bruce Rosen had sent me and Oscar Michelen his Certified Letter later December 2011. W responded the first week of January 2012. I am posting my letter for all to read because I do not want to revisit these topics again. I am writing in reply to the Certified Letter you sent to me and Oscar Michelen on behalf of your client, Julie Stewart, shortly before the Christmas weekend. As per the informal email notification I sent you prior to the New Year weekend, I finally had some time to reflect on what you wrote. First, let me say that I understand your current position in writing to Oscar and me. I view your letter as an introductory letter and one that appears to be carefully worded in a way that is respectful but also seeking a desired result for your client. And because this is an introductory letter, I surmise you may not be aware of the entire history of this dispute. I do not believe you have fully read or researched the extensive list of URLs you submitted to us. It simply looks like a wholesale list your client prepared which contained her name or some passing reference to her. Simply based on the fact that her name shows up in a post, is nowhere a good reason to take down a post much less qualifying as a defamatory post. I make these assumptions about you because I find it very difficult to believe that a lawyer with your level of experience, credentials, and reputation to actually believe Oscar and I have made any false or defamatory statements about Julie Stewart. I also have to believe that if you made a cursory effort to look into both our professional reputations and what we do, you might have written a far different letter. While we are certainly fallible and can make mistakes, we do make every effort to report accurate information. This was explained to Julie already via my first email reply to her. Keep in mind that our reporting accurate information does not mean we are not allowed to share our personal or professional opinions. While there may be commentary on our forums that could be interpreted as insulting, ridiculing, condescending, or even sophomoric, that is still a far cry from being defamatory or qualifying as actual defamation. Regarding your usage of the word “malice” towards my intent or actions, I prefer the word/phrases “outspoken”, “annoyance”, “commitment to principles”, and “freedom to express opinions”. I have never met or spoken to Julie Stewart so it is very difficult to have malice towards someone I have not met or spoken to. Certainly, I feel a great deal of annoyance regarding all the time and energy she has made me expend in the last two months. But being annoyed and feeling malice are two very different feelings and intent. You should know that I have come close to reaching out to her twice before she continued to engage in her irrational, self-destructive behavior regarding the handling of this entire debacle. She has revealed herself to be overly emotional and slightly irrational in my view. Her turncoat and threatening behavior towards a letter recipient that both settled with her (and she profited from) who had sympathy for her and advocated for her has been disturbing to hear about. Regarding our use of the word “extortion” within ExtortionLetterInfo.com (ELI), the ELI Forums, and her association with that word, that has been explained many times ad nauseum. From the very creation of ELI in 2008, we have defined our use of the word “extortion” and phrase “legalized extortion” as being descriptive terms. We have always used the word in a descriptive, colloquial manner, not the literal definition which conveys a criminal act. Further, two months ago Oscar and I prepared a video that once again explained our use of those terms. You should know that the word “extortionist” almost never comes up as it personalizes the descriptive term. All of this is quite self-evident to any literate person that actually reads what has been written IN CONTEXT of ELI and the ELI Forums. Regarding the supposed lowered reputation standing of your client, might I suggest that she herself caused much of this so-called damage all by herself? If there have been damages, most of it has been self-inflicted. Despite her supposedly being a knowledgeable Canadian lawyer, she appears to have little or no insight in how to defend her position or reputation. If anything, she has continued to provoke us and the ELI community with her annoying harassment actions and ongoing legal threats. • Email accusations that we engaged in defamation, libel, and slander. • Submitted a false DMCA complaint to my hosting provider which I challenged with a counter-notification letter to reinstate the original content. • Submitted multiple false DMCA complaints to Scribd causing our online account to be reputationally damaged. Again, I had to file counter-notification letters to reinstate the contested content. • Inciting other lawyers to engage in harassing behavior against my hosting provider and our Scribd account by filing false DMCA complaints forcing me to file counter-notification letters to reinstate that content. • Has engaged in sneaky, harassing behavior towards my business associates so that they would influence or coerce me in removing content about her. • Contacted a lawyer to “speak” with Oscar (who does not own or have administrative powers over ELI or ELI Forums) but not me (who does own and have administrative powers). • Making the false assumption that our prior attempts to appease your client were signs of our weakness which seems to have emboldened her to push even further by hiring you to speak on her behalf. • Remaining silent trying to do the “right thing” as she schemed, called different people, bouncing from person-to-person trying to find someone that could coerce me into removing posts about her. In retracing our history of Julie Stewart, she brought the whole thing to light when on November 13, 2011, she objected to the one small buried post about her and her settlement demand letter (originally posted on October 28, 2011) where we shared a copy of the business letter she herself sent to a letter recipient accusing him and his company of copyright infringement. The letter recipient sought our assistance by sharing that letter with us. Had I realized the pointlessness of the exercise to appease her, I would not have even bothered to make those changes because they were not defamatory to begin with. Until I received your letter two weeks ago, your client has been busy behind-the-scenes scheming and trying to coerce everyone else except me to rally to her cause. I stayed silent because she did not address me and hoping that she would grow tired of all her shenanigans. Further, I addressed those issues that were requested of me. And despite my personal objections, I went out of my way to find actions in the spirit of accommodation. I suggested and implemented the lockdown of earlier discussions about Julie and Blackline, put a moratorium on any new topics discussing her or Blackline, and “hiding” Oscar’s original response to her to minimize her embarrassment. This was conveyed to her previous attorney via Oscar Michelen. Somehow, this “goodwill” offer was misunderstood and twisted into a self-perceived settlement offer that she needed to be approved because she “declined” the offer. It was not a settlement offer of any kind and it did not need to be approved by her. It was simply something we unilaterally decided to do to try to put the dispute behind us. I did it mostly out of consideration for my business associates who had more sympathy for her than I did and they grew tired of her harassment and the nuisance factor. You might be interested to know that the one person who had the MOST sympathy for and advocated for her the most was the original letter recipient who paid and settled with her! He has since been “rewarded” by yet more legal threats against him from her. Mr. Rosen, believe me when I tell you I have endeavored to stay quiet, not instigate new incidents, and simply let the discussion threads fall by the wayside by not adding to the existing commentary. As of this writing, those threads of discussion continue to be locked down. However, since your client cannot seem to leave this well enough alone and appears to not “get it”, there appears to be no point in remaining silent anymore. Julie has been irrationally and unreasonably single-minded in her pursuit to remove all references to her within ELI and the ELI Forums. There is simply no legal cause for me to do so despite what you or Julie might otherwise claim. Julie has taken our continued effort to stay silent as weakness on our part. It has only emboldened her to further action as is self-evident by your letter to me. Given this, your letter on behalf of Julie and my response to you will be made public for all to read. This is not something I want to do but I will not continue to be silent any longer. In the U.S. all citizens have a right to speak out and I will once again be exercising that right to do so. Her hiring you to write your letter has simply opened the Pandora’s box further. If I am to be legally harassed and threatened further, I see no point in remaining silent. Your client will not let it go and I stand by my words and I stand by what I do. On a personal note, I have told people over the years I became an independent publisher to have the freedom to publish what I want. My desire for editorial independence is deeply personal. I have a great love and respect for the First Amendment and the Free Press. Only in the U.S., can we enjoy these freedoms. This personal belief extends to my video broadcasting endeavors and forum management style. However, there are two caveats I follow. Tell the truth and report the facts. I am not interested in making up gossip or fake stories. As a businessman, I am not beyond some degree of publicity, sensationalism, and editorializing but I am a big believer in accurate reporting and getting the facts correct. If I go outside reporting the truth and facts, I make it clear what I say or write is opinion, editorial, or satire. And in all forms of communication, I am mindful of CONTEXT. Most lawyers understand this concept also. I state all this not because I want to be on a soapbox. I state this because I am making a very personal stand, believe in my mission, and protecting my rights. And that means I will fight passionately and aggressively defend my rights to write, express freely, and report accurate information even if someone doesn’t like it. In regards to my relationship with Oscar Michelen and his involvement with me and ELI, this has been covered many times. Oscar has never had any ownership claim to ELI. He is a voluntary subject matter expert. He has been given full autonomy to participate as much or as little as he wants within ELI and the ELI Forums. He has the freedom to use (or not use) the ELI platform to express his personal and professional opinions. I found it interesting how much time your client has spent in the last two months trying to coerce Oscar into cooperation when he has no legal or administrative rights to ELI or ELI Forums beyond his own user account. Additionally, Julie has gone back to bullying and legally threatening the letter recipient who already paid and settled with her. I can only assume your client is afraid or unable to deal with me. 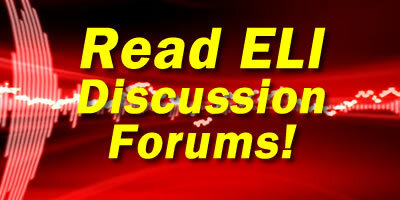 Regarding the ELI Forums, our community members are encouraged to express their feelings, report information, and share comments as long as they do not violate our forum policies to post inaccurate information or to be overly profane, hateful, or malicious. It is certainly very easy for others to request me to take down certain posts they do not like. And although I have the power to do so, I won’t do so without a very good reason. Unless there are factual errors or gross violations of forum conduct, I am not going to take down information we have reported and commented on. It takes away from the integrity of what we encourage which is to openly discuss and report on such matters. The ELI Forum community has grown, commands great loyalty and camaraderie because of their trust in the ELI team to be open with them. Even when we were under attack by Julie and her lawyer friends’ DMCA Complaints and threats of being shutdown, we continued to be open and report on it and the ELI community stood by us and what we did. They showed support by reaching out to us, adding commentary, increased readership, and additional Paypal donations. Until ELI and the ELI Forums were created in 2008 and when Oscar and I jointly decided to put our faces, names, and reputations to the mission, the shenanigans of the stock photo “extortion letter scheme” has largely been secretive, underground, unorganized, uninformed, and unreported beyond anonymous complaints. Over the last 3.5 years, Oscar and I have become the most visible advocates and defenders of people receiving such heavy-handed “extortion letters”. While it may seem that we are targeting Julie, it is simply untrue. If you were to study ELI and the ELI Forums, you will find that Julie is simply one of many lawyers we have discussed in the past and her settlement demand letter is one of many we have openly shared and reported on. And although some lawyers have contacted us to express discontent and disagreement with what we do, once we clarify our position and our intent, all of them have quietly gone away without incident. And because they have quietly gone away, any prior threads of discussion about them have also been buried over time. It is my hopes with this lengthy and detailed letter that you too will see the wisdom in letting this matter finally die. Unfortunately, Julie has gotten far more attention from ELI and its community than any other lawyer (except Oscar, of course) because she continued to attack and harass us with veiled threats and nuisance actions. Until Julie realizes we are committed to our mission, I will continue to fight for our right to openly report, discuss, and comment on the stock photo “extortion letter scheme” and those who partake in it. Quite frankly, I consider ELI and the ELI Forums part of the “free press” with the rights to report and editorialize as any other newspaper website can. Let us not forget that Julie at any time could have taken the time to engage our community and posted her side of the story. Instead, we had to hear her story through others and hearsay. By your own writing, in the 3rd paragraph of your letter, she could have stated that herself. It didn’t have to be in your letter. As an experienced lawyer, you are expected to do certain things for your client such as “warn” me, as a potential defendant, of potential legal consequences. You, however, should in turn remind Julie that do I live in the U.S. and the test of defamation, libel, slander, malice, and any other supposed violations will be held to U.S. court standards, not Canadian standards. She should be informed there are specific protections in the U.S. for free press, free speech, open commentary, etc. She should also realize that if she decides to actively pursue and file a lawsuit, there are several non-profit organizations that exist to ensure that my rights to freedom of speech, freedom of reporting, and freedom of information are protected. ELI is part of the reporting, press, and blogging community. Its interests and content are protected by law. The DMCA provides some protections from what other people may independently post. Having said that, I have no tolerance for someone stepping over the line and violate forum policies. I do not need the DMCA to protect me in certain cases because I would intervene beforehand. Julie needs to know that there is a limit to my patience and it has nearly come to an end. I have tried to be sympathetic to her when possible but she has persisted in behaving in a way that is both unreasonable and irrational. I cannot stop her if she does not want to. But I am not going to sit around and continue to be in reactive mode. I could be compelled to take harsher, preemptive measures if she continues to engage in harassing and nuisance behavior. Mr. Rosen, you state the she reserves the right to pursue any legal remedies in a court and jurisdiction of her choosing. You also state that she reserves the right to all causes of action that may have accrued to the point at which she files an action. I believe this works in both directions. Since you made a posturing statement on Julie’s behalf, it is only fair I make one of my own. As you know, any potential lawsuit opens the potential for a counter-suit. Any request for discovery can also result in the potential for counter-discovery, any direct examination is subject to cross-examination, and so forth. Further, any lawsuit filed against me or ELI would be of public interest. I wonder how the media and public would like for a legally-educated Canadian lawyer trying to silence a legally-uneducated American blogger in the United States, the land of free speech, open reporting, and the First Amendment. We can spar back and forth for the next few weeks and months wasting everyone’s valuable time or Julie can grow up, get smart, and learn to deal with it. If she continues to harass me, I could be compelled to file a formal written complaint with the Canadian Bar within her jurisdiction. That same complaint I would openly share with the public and online. It is safe to say my complaint would be amplified and not paint her in a flattering light. The very content she asked us to remove would be provided in print and submitted as part of the complaint to explain the CONTEXT of my complaint. And if I were compelled into making a written complaint, there would be more dialog and exposure about Julie and her antics, not less. Might I suggest that Julie read some good articles written by the Canadian law firm, Zvulony & Co. about defamation? I mention them because they are also Hawaiian Art Network lawyers that deal with defamation issues. He provides good insights that Julie might want to consider and reflect upon. As an experienced lawyer, you know that truth is an absolute defense against defamation even if it is damaging. And no one has pointed to anything we have posted that is untrue. The wholesale URL list Julie provided does not qualify. She is seeking an entire sweep-out which is unreasonable. Embarrassing content does not qualify as defamatory. Having her name associated with our website might be damaging to her reputation but is not defamatory. Towards the end of your letter, you advise us to not delete any computer files due to spoilation of evidence? Without trying to be disrespectful, I find it peculiar how the majority of your letter focuses on making demands on us to remove all the offending posts and links and yet at the very end you advise us to NOT delete any “evidence”? The truth of the matter is, I never wanted to alter or hide anything on the ELI Forums or Scribd where Julie or Blackline was concerned. I was more than happy to let it all remain open and stay public. It is Julie who keeps trying to have us delete and remove content about her. Any minor alterations we have made were done in favor of her public image, not ours. In fact, you can tell Julie since has the screenshots of the original unedited and unaltered content, I will be happy to post it for her. Quite simply, I want to report and reveal more, not less. I welcome restoring the original unedited and unaltered content. You stated your client has retained the original screenshots. I would advise YOUR client to NOT destroy those screenshots because I would insist they be displayed as Exhibits so that I could prove my original points. If Julie claims to have those screenshots but then refused to show them, then SHE could be accused of spoilation of evidence, not me. Mr. Rosen, you ask us to “be advised accordingly” that she can take legal action without further warning. Well, the sentiment goes the other way also. I have been extremely patient and quiet while she has continued on with her nuisance campaigns. I could have reported on all the things she did these last two months instead of letting the public and the ELI community think that Julie Stewart disappeared and was “long gone”. If anything, I am guilty of not telling the ELI community what was truly going on. Quite frankly, I am tired of all the cloak-and-dagger activities. I much prefer to have ELI-related activities out in the open. I know you are doing your job with representing Julie but you should ask yourself if you and your law firm’s image is well served trying to represent a Canadian lawyer in trying to remove content that she herself created and instigated which could have been entirely avoided without all the bogus DMCA complaints, attacks, inciting lawyers, cloak-and-dagger coercion. Julie is not painting herself in a positive light. And despite your attempts to word your letter carefully, there is no question in my mind that ELI is in a solid position. Julie comes across as a naïve lawyer with little or no PR or “street” experience. Running around threatening people who don’t own or control ELI is cowardly, futile, and trying to take advantage of someone’s legal ignorance. Running around being emotional makes her reputation as a lawyer seem inexperienced, unprofessional and certainly unbecoming. I also respectfully ask that you look more closely at the wholesale set of URLs you submitted before you escalate this matter unnecessarily. What it comes down to is an amateur Canadian lawyer who got blind-sided with the negative publicity and the intense scrutiny of her credentials as a result of her being associated with Hawaiian Art Network. Further, it was her sensitivity, naiveté, and lack of PR experience that has gotten her into this PR mess. As hard as you tried otherwise, your letter has simply made it worse for her because I have no intentions of keeping silent about this. If I am to defend myself, I have every intention of openly recruiting and asking for help wherever it may come. I have no intentions of going it alone. I have no wish for us to be adversaries but just realize that I am not a lawyer. I am not bound by the same rules of conduct lawyers are. I am certainly not smart enough to “out-lawyer” you or any other lawyer especially one with your credentials and experience. But that does not mean I won’t aggressively defend myself and, if necessary, go on the attack. Further, I implicitly believe in justice and that U.S. judges are smart and fair-minded enough to see the truth through the smoke and mirrors Julie is trying to paint. Julie’s futile and annoying attempts to suppress her information on the ELI Forums have gone on long enough. It must end immediately. I will no longer be silent. If she, you, or anyone else escalates this any further, it will quickly become very unpleasant for everyone concerned. I trust that you can see by my very lengthy letter that I am firm and committed to my position. Further, this letter has gone beyond the call of duty to explain my position, the context, and why we have done what we did. Thank you for your careful attention and reading of my letter. As far as I am concerned, this matter is now closed and resolved. ELI and its team will continue on as we have been.